Most of the damage by hurricanes isn’t caused by the high winds, but by the water that they bring. For this reason, as well as the suddenness of a flood hitting, it is difficult to defend against one. But if we want to be truly prepared for any disaster, then we must include the possibility of flooding in that preparation. It’s important to note that only people who live in one of those 100-year flood zones are required to buy flood insurance as a condition of their home’s mortgage. So, if you don’t live in one of those areas, you probably don’t have flood insurance. What this means is that if your home gets flooded, the insurance company isn’t going to help. Should your home flood, you can expect to have to replace drywall, carpeting and wood trim, at an absolute minimum. You also might have problems with mold forming from the water, requiring extensive treatment to eliminate. Homes in Mexico and many other emerging countries are built out of cinder blocks and cement, with tile floors. While not as elegant as our homes, these structures withstand the ravages of flooding much easier. The standard way of protecting a home or other structure from flooding is with a wall of sandbags. Such a wall must be continuous, without any gaps and of an even height. Any sandbag wall or other protective measure must be built at least a few feet away from the home. The biggest problem with sandbags is that they require a lot of material and a lot of physical work. There are some flood control alternatives on the market. These are basically flexible plastic tubes, which can be filled with water, forming a barrier that is much like the sandbags. A lot of survivalists/preppers store their stockpiles in the basement, the first part of any home to flood. While a hot attic isn’t the greatest place to store food, many other items can store there safely. As long as the roof remains intact, chances are that even if your home floods, those items will remain safe and protected. Make sure that your stockpile is split up. If everything is in the basement, and your basement is flooded, then you’re not going to have anything to eat until you pump out your basement. The lesson here is not to expect the government to tell you when to bug out. Officials will make the best decisions they can, but they can’t peer into the future any better than you and I can. You must make your own decision, and you should do it before the government does. That way, you can beat the rush and not end up being part of that 100-mile-long, 18-hour traffic jam. But this may not always be possible. The people of Houston really had no idea that they would be subject to such a savage storm. A last-minute change of direction caused the hurricane to make landfall near Corpus Christi. 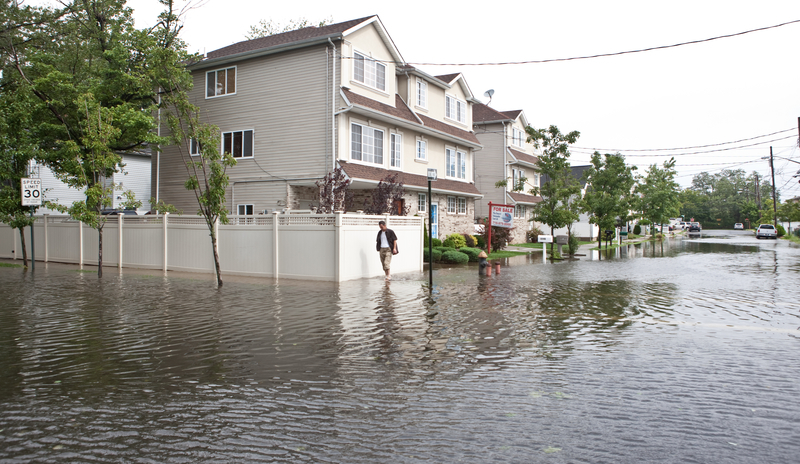 To start with, you need to keep alert when a storm is occurring that could cause flooding. Track the storm’s progress, rainfall and potential storm track. As flooding occurs, move to higher ground. Whatever you do, don’t go into your attic to avoid the water. Your attic doesn’t have an escape hatch onto the roof. People have died that way when the waters continued to rise and they couldn’t get out of their attics. Rather, go out a window and climb onto the roof. Better yet, have some means of escape on hand. This usually means a boat, which is a rather expensive investment. But you could use a rubber raft, canoe or kayak instead. If you want to go even cheaper, inflatable air mattresses make fairly good emergency rafts. Always be sure to know where higher ground is. You can find this by downloading topographical maps of your area from the USGS (US Geological Survey) here. Do you have a hurricane escape plan in place?